To Sum It Up: Braedyn Murphy has never thought of herself as anything but ordinary. As her sixteenth birthday approaches, however, everything Braedyn has ever believed about her life is going to be turned upside down. Demons are real and closer than she could have imagined possible, and they have a particular interest in Braedyn. A war is building, and she’s caught right in the middle of it. Lee's Review: I seem to be stuck in a bit of an odd reading cycle lately, where I either absolutely love a book or have to push through to finish it. Unfortunately, Thrall falls into the latter category, another case of a solid premise that pulls up short in the execution. Although I really liked how the story of Lilith, Adam’s first wife according to some legends, was worked into the novel, that alone wasn’t enough to wholly invest my interest in the book. I’d read some books featuring demons before, but none that focused on the succubus in particular. They’re called Lilitu here, and despite their breathtakingly beautiful appearance, underneath that surface lurks a potential destroyer of souls. There’s a Guard that fights to combat the havoc that the Lilitu wreak, and as far as good vs. evil battles go, I thought this one had a nice little twist to it. This book had some strong framework on which to build a rich story, but the slow pacing worked against it. I often found it difficult to settle into long reading sessions with Thrall because it felt too drawn out. The exposition could have used some trimming, as could have the character descriptions. Whenever a new one is introduced, you’re given a mini biography of his/her life that starts sounding like a block of telling and which breaks up the flow of the narrative. I would have liked to have seen more showing, to have become acquainted with the characters through their dialogue and actions as opposed to what was said about them. I had a few quibbles with the main character, Braedyn, mostly her lengthy reflections at the beginning of the novel on how unexceptional she was. Braedyn believes that she’s plainer than plain and then some, and the reiteration of this idea touched a nerve more than once. I could see how her self-perceived ordinariness figured into the part of the story where her Lilitu powers begin emerging and suddenly every guy at school now notices her. I suppose I just wasn’t keen on the transformation-into-a-swan angle. I also found Braedyn a little lacking in development as a heroine. Even in the later chapters, she’s still unsure of herself and looking to the Guard to save the day. Believing in Braedyn as a heroine proved challenging when she didn’t believe in herself. Though they were up to no good, the Lilitu were interesting to read about and lent the novel some welcome edge. That’s what I think Braedyn needed—a touch of fire to her character to make her less of a cookie-cutter protagonist. Thrall delivered well on the paranormal side of things, but I can’t quite say the same about some of its other aspects. 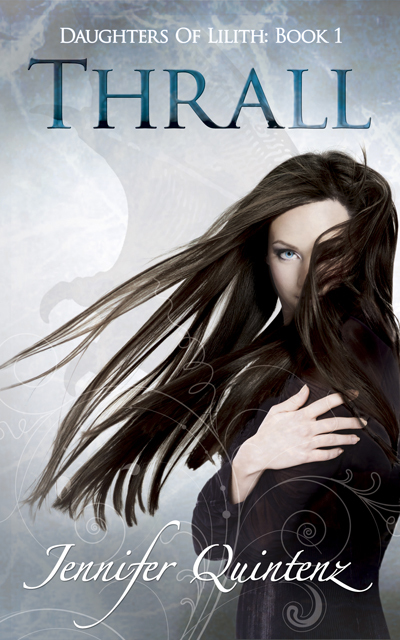 All in All: While I liked the book’s take on demons, I wasn’t as enthused about Braedyn as a narrator/main character. 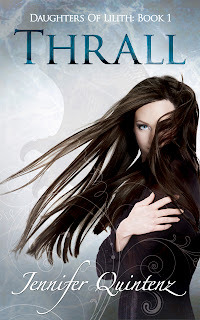 Ally's Review: Thrall sounded like a story I would really enjoy. Demons, angels, and demon hunters—what's not to like? What I wasn't expecting was all the stereotypical teenage angst and high school drama that took up most of the book. Oh, the drama. I was slightly offended reading about Braedyn's high school life. Being in high school myself, I found the whole interpretation comical and highly inaccurate. You had the mean jocks, the bitchy cheerleaders, and the self-righteous outcasts. Braedyn and her friends obviously fall into the last category. The whole high school scene was very distracting. I felt like it tried so hard to be a part of the plot that it ended up taking over the whole book. Instead of reading about demons and hunters, I was reading about high school dances and bullies. Braedyn, herself, wasn't a bad character. I actually though she was kind of all right. All the other characters were bringing her down. Her token best friends, who are terribly stereotypical, have so much book time but have nothing to contribute. Seriously, they are wasted. They pretty much do nothing to help Braedyn in her transition from teenage girl to demon. All they do is drive her to and from school. The man of the hour, Lucas, is the absolute worst. Of course it is love at first sight for Lucas and Braedyn. And of course their love is forbidden because Braedyn is a Lilitu—a soul sucking demon, and Lucas is a member of the Guard—a team of Lilitu hunters. But despite all of Lucas's training, he fails to see that his girlfriend isn't necessarily human. Lucas was so clueless that he quickly became my least favorite character. Braedyn is no better. She is told, time and time again, that she needs to stay away from Lucas for his safety. But does she care? No, she loves him but she'd rather be selfish and endanger him with her presence instead of keeping her distance. The whole romance is a mess from the start. The coolest part of the book should have been the Guard. Somehow, the demon hunters turned out to be super lame, though. They are such a hindrance and spend almost the entire book running around like headless chickens. They have no idea what they're doing. The Guard is really judgy, too. Braedyn is treated like crap, although she's the one doing all the work. The most redeeming aspect of the book is the bad guys. The Lilitu are cool. Not only are they practically all women, but they're also pretty powerful. I really enjoyed learning about the back history of Lilith and her daughters. I also liked how there was a dream realm involved. The demons were so interesting, and I wished they would have been focused on more. The book was easy enough for me to get through because I found it somewhat entertaining. That being said, I didn't particularly look forward to sitting down and reading it. I have no attachment to the characters and I have nothing that motivates me to be intrigued to find out what's going to happen. All in All: Thrall was disappointing in some ways and interesting in others. What I expected to like, I hated, and what I expected to dislike, I enjoyed. It's safe to say I have mixed feelings. Aww, too bad there were so many issues with this book! The premise is interesting - I haven't read as many demon stories, and it's great that there is a strong foundation for the world-building! Great review though - it was interesting to see your two perspectives on the same book! I love comparing reviews of the same book with Ally. Sometimes we disagree, but on this one, we ended up having very similar feelings. For a demon book, I highly recommend Brenna Yovanoff's The Space Between; she's such an amazing paranormal writer!